A bible for day to day life, for overcoming the small, as well as large, hurdles that pop up on a daily basis. Putting the Word to Work: Questions that enable readers to evaluate their lives and apply the Scriptures in their everyday situations. Speak the Word: Verses adapted to be first-person confessions or prayers `placed near the corresponding verse`, bringing the promises of the Bible to a new, personal level. The Everyday Life Bible takes the wealth of Joyce`s teaching and weaves it into the Amplified version of the Bible - the same version she uses on her program, the same version all her readers can now use at home. The Everyday Life Bible: Hardback by Joyce Meyer was published by Hodder & Stoughton in November 2006 and is our 3504th best seller. 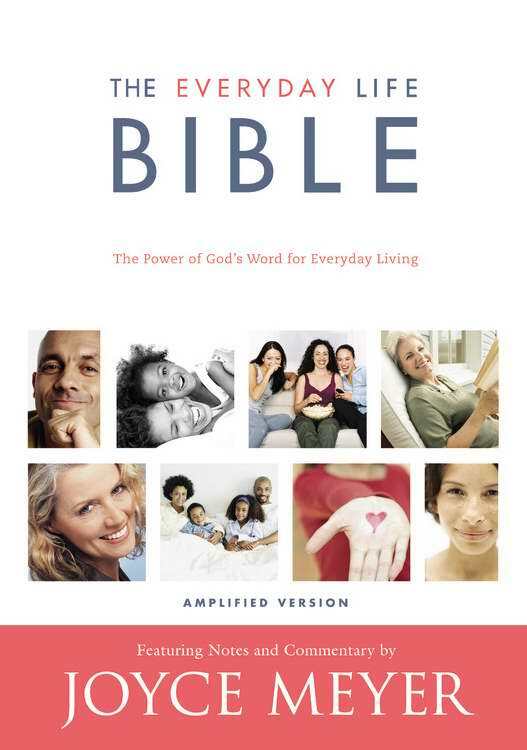 The ISBN for The Everyday Life Bible: Hardback is 9780446578271. The Everyday Life Bible - The Powerful Practical Way to Enjoy Everyday Life. This is not just an amplified Bible but an easily readable Bible for everyday life. Joyce Meyer truly writes from her 30 years of Bible study with experience and knowledge. Joyce takes God's word and applies it to everyday situations with her practical 'LIFE POINTS'?. An insight into how God's word can change your life is shown under the headings 'PUTTING THE WORD TO WORK'?. Speaking out loud Bible verses over and over again is a very powerful weapon, under the headings 'SPEAK THE WORD'? Joyce adapts Bible verses into first-person confessions or prayers bringing the Bible to a new personal level. Most Helpful. Got a question? No problem! Just click here to ask us about The Everyday Life Bible: Hardback. Does this come in soft cover?